Made by Brown, Amelia in Bowning, New South Wales, Australia, 1857-1900. Mrs Amelia Brown, who made this quilt, lived in Bowning, a village just north of Yass in New South Wales. She probably made the quilt for Margaret Swann of Elizabeth Farm in Parramatta, and was known to the Swann family at least as ?Grannie’ Brown. Some sense of Mrs Brown’s life and leanings can be inferred from examination of the quilt itself - from the economy of its construction, the rhythm and balance of the design, and the subject matter of the central appliqué medallion. Rectangular patchwork pieced from square, rectangular and triangular patches, cut from plain and patterned cottons (including small floral prints, checks and stripes). Pieced around a central appliqued medallion of the unofficial coat of arms of Australia, emu and kangaroo flanking a central plain shield with four star motifs, one in each corner. Medallion is worked in plain red cotton on plain cream ground. Hand sewn with hand quilting running thread forming a continuous design of circles, hearts and petal segments. Quilt is unfilled and backed with patchwork pieced cream cotton. The quilt was designed and made by Amelia Brown (1817-1905) who arrived in Australia from Exeter in 1857. She and her husband, John Brown, had seven children and settled in Bowning, outside Yass. The quilt is one of two known to have been made by Amelia Brown and closely resembles the other one in both materials and construction. The quilt was made by Amelia Brown (1817-1905) of Bowning, New South Wales, possibly with the assistance of children. 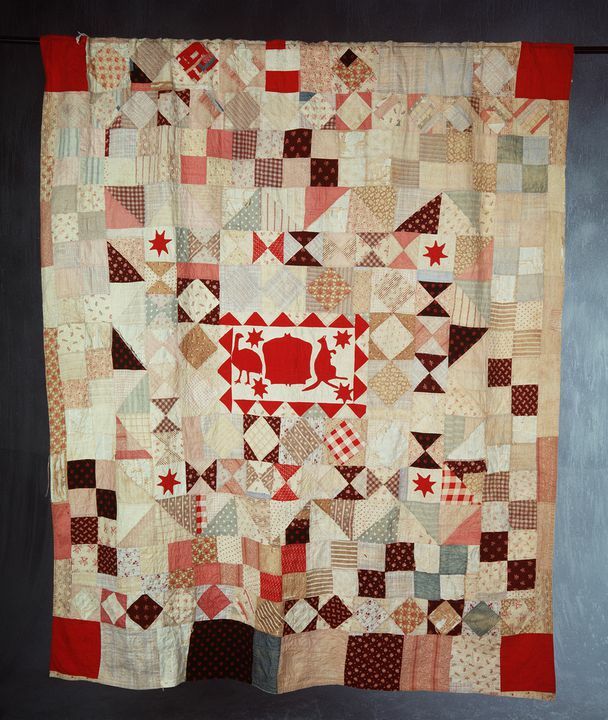 The similarity of this quilt with the one made by Amelia Brown on her voyage out to Australia, suggests it was made during or shortly after her arrival in Australia. Quilt made by Amelia Brown in the late 1800s and later given to Margaret Swann of Elizabeth Farm, Parramatta. Quilt inherited by Edith and Ruth Swann, sisters of Margaret. When Elizabeth Farm was sold in 1968, Edith and Ruth took the quilt with them to Dural. On the death of Ruth in 1976, the quilt was inherited by Margaret Swann, niece of Edith, Ruth and Margaret. She sold it to Leigh Taumoefolau around 1978, who in turn sold it to Toby and Juliana Hooper, Melbourne antique dealers.